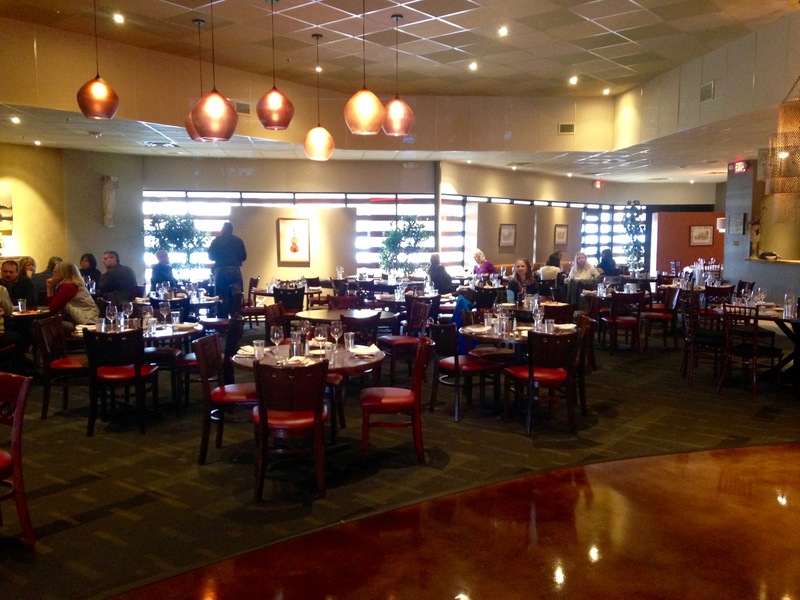 When Atlanta’s venerable Vini, Vidi, Vici closed in 2015, pasta lovers wept. 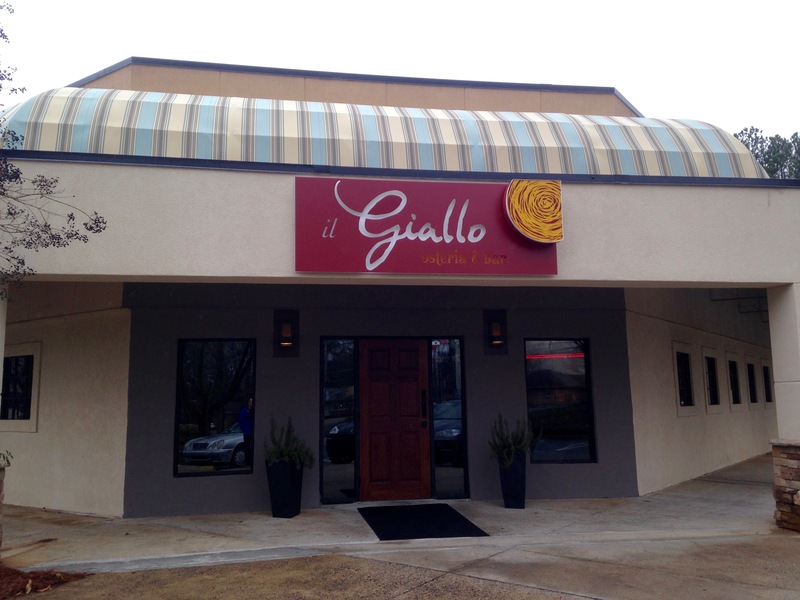 Cry no more, pasta people, because the team behind V-V-V has resurfaced in Sandy Springs at il Giallo Osteria. Chef Jamie Adams did the cooking at V-V-V. Leonardo Moura was the General Manager. 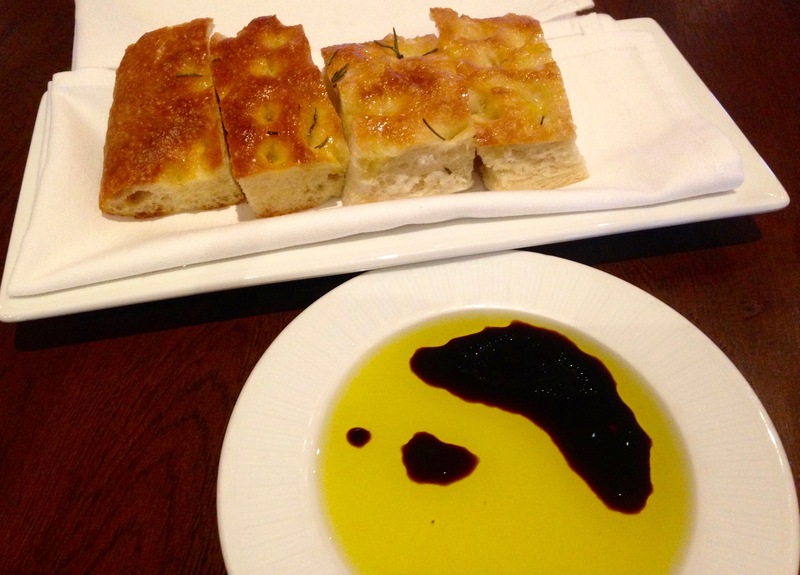 Together, they opened il Giallo a few months ago in one of Sandy Springs’ interminable shopping centers. In case you didn’t know, il Giallo means either “yellow” or “mystery” in Italian. If it’s a mystery to you why some pasta is so yellow, it’s because of egg yolks. Now you know. Acting on a tip from “Grammy Boots”, we pay a visit. 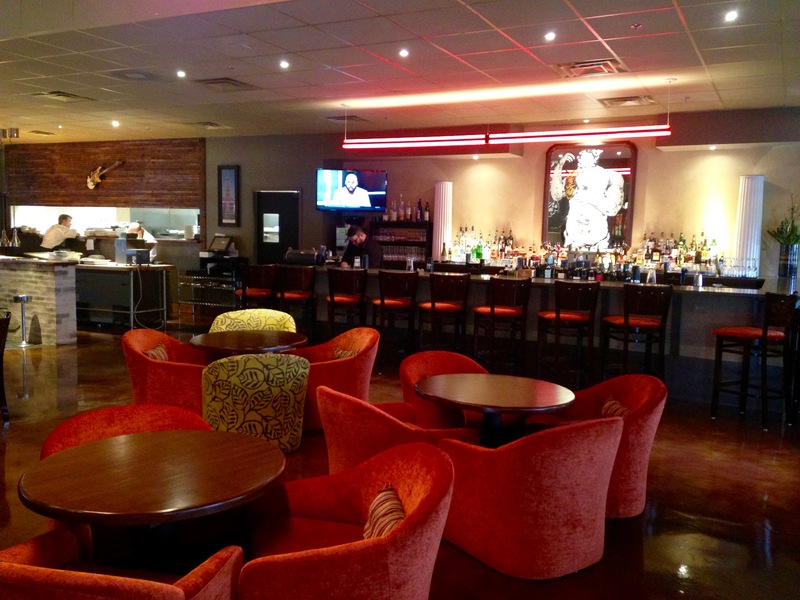 This is a large place, with two private rooms and a nice, roomy bar. Ever notice how restaurants face the chairs in the same direction when nobody is sitting at the bar? So tidy. We are here today on a Friday lunch date, when things are not as crowded. il Giallo is very close to the Lefont Cinemas, so you can enjoy a meal and a show. Speaking of show, there’s one going on right here at il Giallo. The pasta is made in full view of the dining room. That’s Chef Adams himself, pulling pasta through the machine. The co-owner makes the pasta every day, and he works throughout most of our meal. A Date Night investigative report finds that Chef Adams uses at least ten kilos of pasta flour a day. That’s a lot of pasta. Soon after we are seated, a plate of warm bread arrives at our table. Warning: this bread is so good you will want another plate. It’s hot, steamy, and is full of rosemary and olive oil. Go ahead and dip it into the oil and balsamic mixture on the table. Don’t eat too much (like we did) or you won’t have room for dessert. Because it’s lunchtime, we pass on wine or beer. We need to stay awake for our movie. We start things off with the polpette. Who puts duck, rabbit and beef into meatballs? Then they cover it up with mushrooms. This is an excellent appetizer that is worth a try. 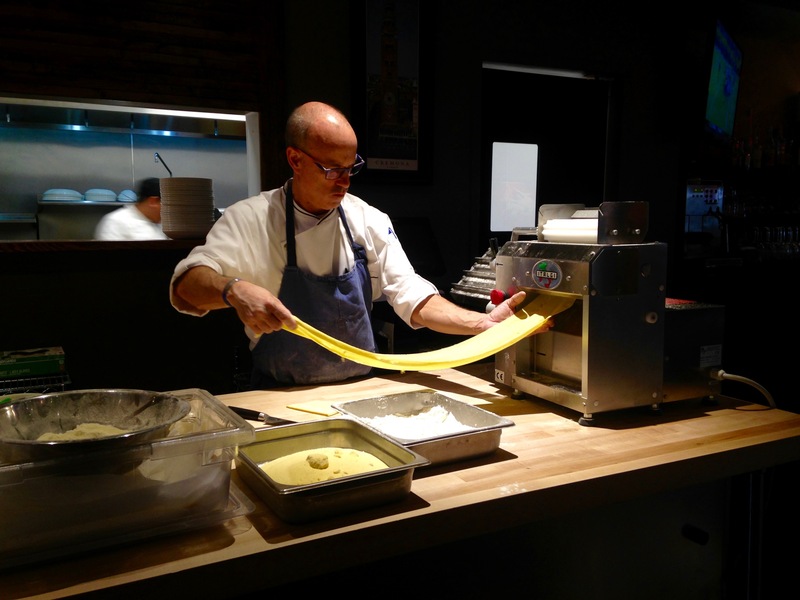 After seeing Chef Adams and his pasta machine in action, you won’t be surprised to find that we both order pasta. Eve goes for the pappardelle. Look at the cool edges on those noodles. They are served with shrimp and two kinds of mushrooms. 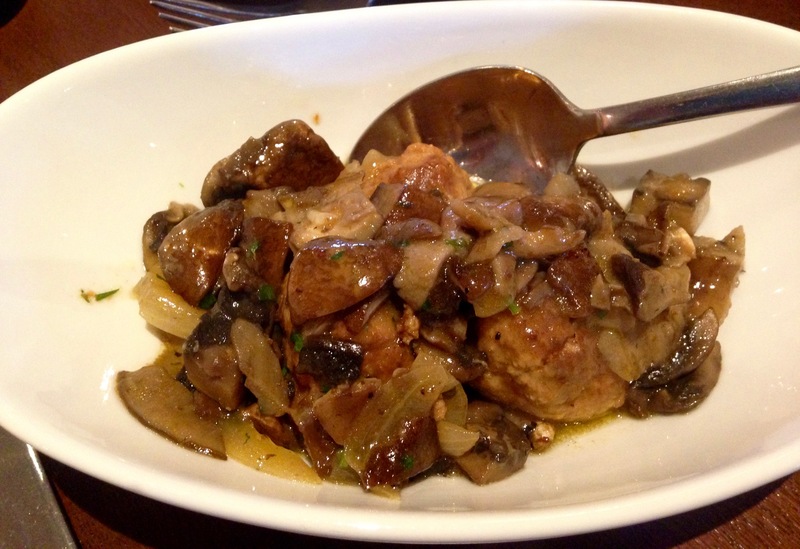 This is a real palate pleaser–the kind of dish you just don’t want to stop eating. There’s a lot of love in that pasta and you can taste it. The same can be said for my agnolotti. 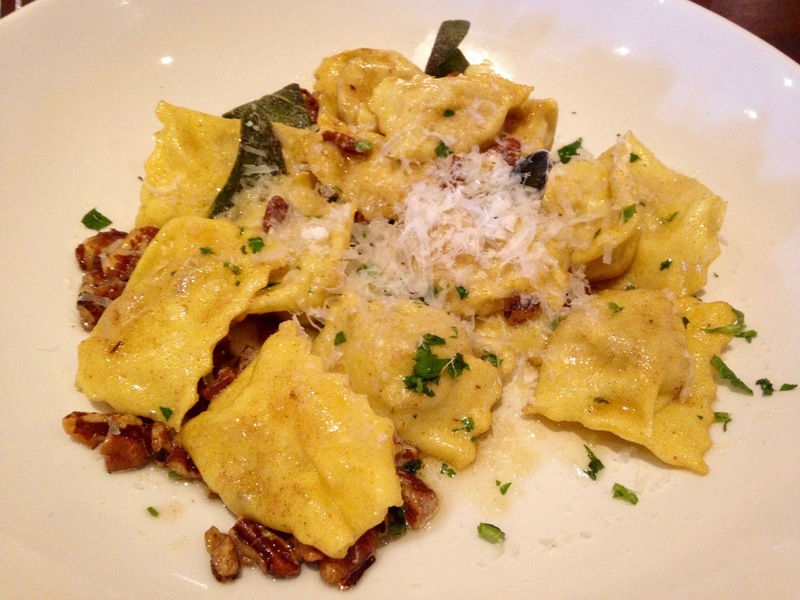 If the duck-filled ravioli doesn’t get you, how about the sauce of brown butter, sage and pecans? They absolutely nail this dish. This is a must-order if you go. Sure, we want to order dessert, but that second basket of bread does us in. We are stuffed, but manage to stay awake at our post-lunch movie. We see “Spotlight”, which is getting a lot of Oscar buzz. This is a food blog, not a movie blog, so we won’t give you a review! The bottom line on il Giallo: We can’t wait to go back. There’s a lot more to explore on the menu, and we’re going to try it. 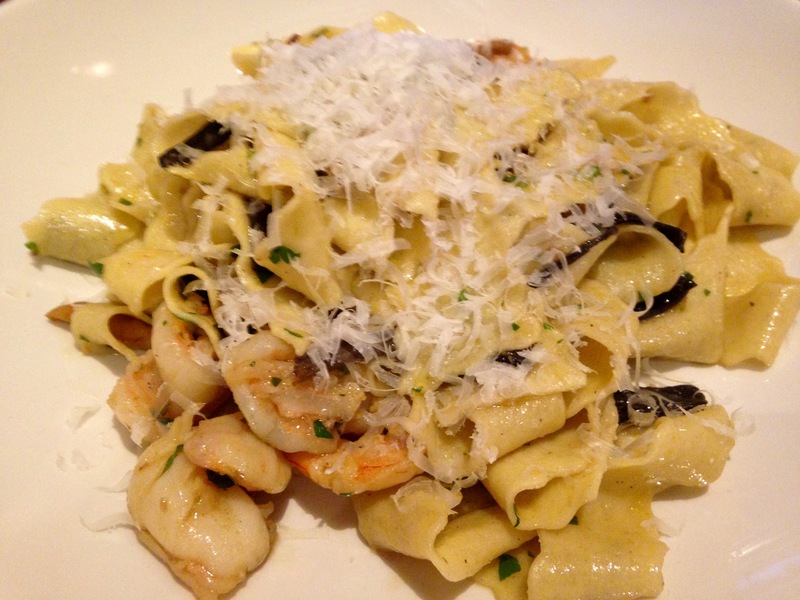 If you are looking for excellent, hand-made pasta just outside of the perimeter, il Giallo is a place you must visit. We loved it, too. Jamie Adams is a wonderful chef and a great guy. Have known him for years and wish him well in his new digs.